How do human beings today receive divine revelation? Where and in what ways is it mediated so that all generations can hear the fullness of the gospel? In this volume, distinguished theologian Matthew Levering shows that divine revelation has been truthfully mediated through the church, the gospel, and Scripture so that we can receive it in its fullness today. Levering engages past and present approaches to revelation across a variety of traditions, offering a comprehensive, historical study of all the key figures and perspectives. His thorough analysis results in an alternative approach to prevailing views of the doctrine and points to its significance for the entire church. 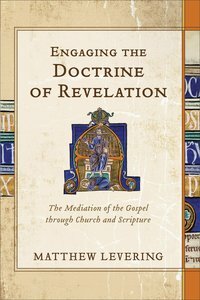 About "Engaging the Doctrine of Revelation"
Matthew Levering(Ph.D., Boston College) is Professor of Theology at the University of Dayton, USA. He has most recently authored Biblical Natural Law (Oxford; Participatory Biblical Exegesis (Notre Dame); Ezra and Nehemiah (Broazoz Theological Commentary, Brazos) and Doing Theology: Catholic Theology (T & T Clark, 2012). He also co-edited Vatican II: Tradition within Renewal (Oxford), and is preparing the Oxford Handbook on the Trinity. He has written and edited numerous other books. He currently co-edits series on Classical Christianity (Brazos) and Reading the Scriptures (Notre Dame), and serves as co-editor of the quarterly journal Nova et Vetera.